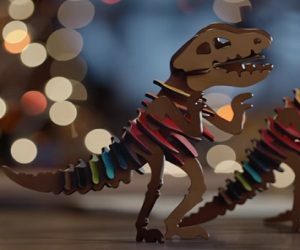 Coach has released a new commercial introducing Rexy The Coach Dino, a wooden dinosaur that comes to life in the company’s New York City workshop. The short holiday film released by the luxury fashion brand features Rexy as she becomes lively at night, when the lights are turned off and she remains alone. Her activities in the workshop include blowing the other small dinosaurs over, dancing by herself on the rhythm of “Dancing With Myself” (by The Donnas) and pitching the gift boxes and the baubles. Briefly, making a chaos. After all that, she gets out on the window and heads off on the city streets. Coach invites you to shop the holiday gift guide at their website.